History lies behind this modern shop frontage. In January 1906 this building was opened as a large laundry, with enough capacity to cater for Rhyl’s booming tourist trade. Dirty clothes and bedlinen were collected by the laundry company’s horse van. Items for washing came from as far afield as Bangor and Llandudno. At the laundry’s Golden Jubilee celebrations in 1955 the manager, Mr GS Hindley, recalled the days when girls started work at 3 shillings (15 pence) for an 11-hour day. 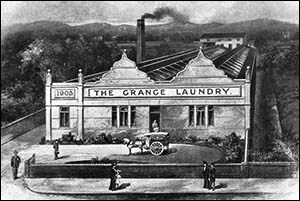 In 1909 the laundry company was fined for breaking working time limits under the Factory Act. A spot check on at 8.55pm on 19 August had revealed that three women still at work had started at 6am, and several others at 7am, 8am and 8.30am. The laundry’s defence was that August was its peak month, when the choice was between breaking the employment law or visitors going about in dirty clothes! Earlier in 1909 there was “considerable indignation” after a large bull mastiff attached to the laundry, presumably as a guard dog, was “horribly mutilated” one night. The early picture of the laundry shows how it was positioned alongside the Cut, visible to the right of the building. Also shown is the “black smoke from the works chimney”, subject of a complaint in 1906 after a report by the Sanitary Inspector. The laundry, which closed in the 1970s, was founded by Mr GA Goodwin CMG, who came to Rhyl for his sister’s health after a successful career as a mining engineer in the Transvaal gold mines, South Africa. He took no active part in the business which, from its inception until his death in 1946, was in the capable hands of Mr RB Worrall, who built up the business together with his wife and her cousin, Miss Nina Godwin. After Mr Worrall’s death, a limited company was formed. Today the building is home to the One Stop shop and Dyffryn Care.